In “Gourmet Flavor,” Terence Sean Davis provides dispatches from the worlds of art, life and food in Chicago. The translation of this place’s name doesn’t exactly fit, “Carnivale” — or “Carnevale” — speaks to a particular period of time where Catholics can cut loose before lent, but while you’re kickin’ it at this lively brick “restaurant-bar” overseeing the Kennedy you can get an experience packed with an assortment of Latin fusion plates that will delight your taste palate. Prior to my visiting Carnivale I had only noticed the place as a spot that stands around some decent parking areas, it wasn’t the most obvious place to make my next food quest, but I ended up with an opportunity to give Carnival a spin. At Carnivale, décor, spirit and menu all collude together to provide a true full-service restaurant experience, it’s almost like being in Aladdin’s living room, if you can imagine such a thing without watching a cartoon. I’m a fan of comfort and cozy so an attempt at executing such a concept will always be thoroughly observed and appreciated… Carnivale is definitely date-night approved. Not to mention, the spot’s music selection was extremely pleasant, ranging from Astrud Gilberto to The Fugees’ “Ready Or Not.” I was groovin’. The staff was very vibrant and full of energy, prompt and ready to serve. As to what they brought me: for starters, I had the calamari with green papaya, carrots, malanga (looks like a turnip/potato), cilantro, smoked hazelnuts and sweet and sour adobo — delicious! You could taste the sweet and sour combining to give you a little zest in your palate. The calamari itself was nice and crispy, it was a bit different than the usual “Italian” style but the combination of the ingredients involved took it to a whole different level, I enjoyed the combination of the hazelnuts and sesame seeds sprinkled on top. The Ropa Vieja at Carnivale. Next was guacamole featuring chunky avocado, cilantro, chilies, onion, garlic, lime and chips. You really can’t go wrong with guacamole, like ever, and Carnivale came through well. Following the guac was Ropa Vieja, a slow braised brisket with sweet platains, malanga, aji amarillo aiolo (orange chili pepper [Peruvian]) and queso fresco. These were fire! I was initially reluctant in trying this dish but then I figured, “why not.” It was NOT a bad choice at all — the sauce was so good that you could almost taste it and imagine it to be barbeque pulled beef. 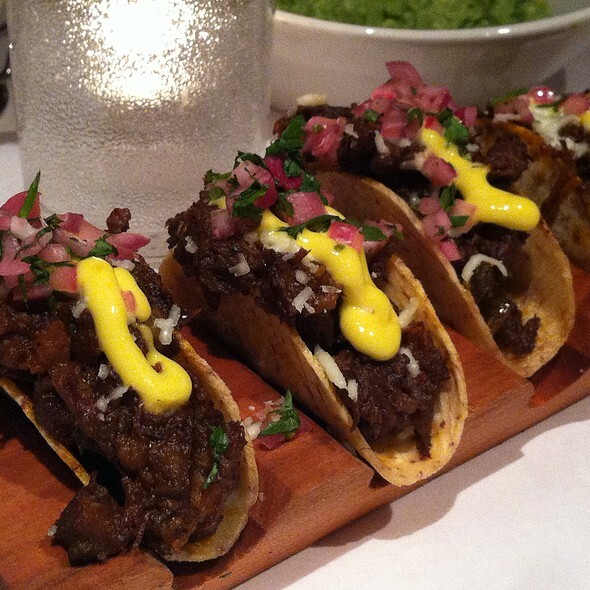 Placed in mini crispy taco shells, the ropa vieja’s presentation was flawless. I love sweet plantains so it made the dish even better. 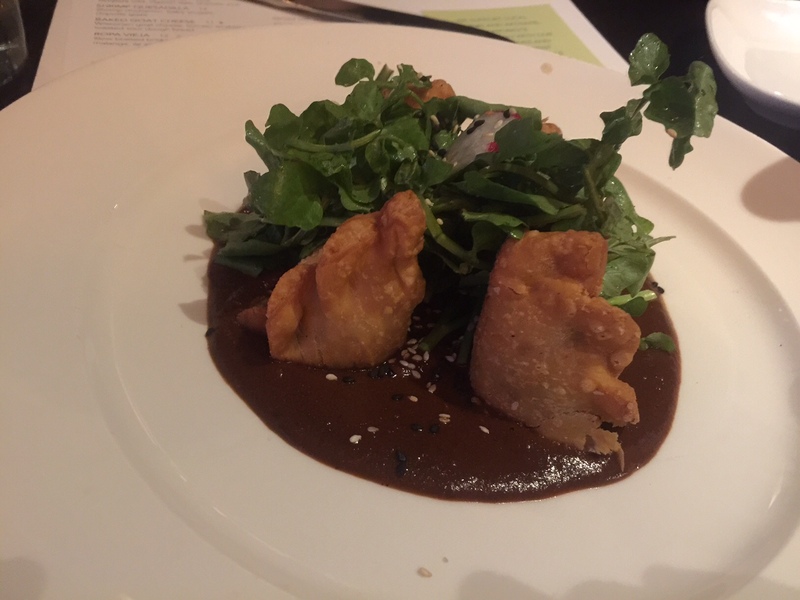 After that, mole empanadas with smoked Amish chicken, mole poblano, watercress and red radish. These empanadas were victorious, I was in heaven! After a great selection of appetizers and beverages it was time for the main course. The entrée — Arrachera, a grilled skirt steak, rice and beans, bacon sofrito and sweet red onion with chimichurri sauce. We’re talking HUGE STEAK here! The meat was nice and tender with so much flavor, a smokey charcoal type flavor to be exact. The only thing I didn’t enjoy here was the rice and beans. I felt that the rice was tough and a bit raw and the beans had no flavor. Overall, I loved Carnivale, it provided a chill, relaxing intimate vibe you’d want in a special dinner. The food — overwhelmingly delicious and festive. Fellow patrons were also friendly, you can get up and hit a lil’ two step to celebrate the experience while Astrud’s sweet vocals float across the room. Leave your fajita pans somewhere else, this is definitely not Chili’s. Special shout out to my fellow dinner friend, Norma Aguilar, who provided some help on this food quest.